Seasons Greetings! Wishing everyone an art-filled holiday season. Visits to the Getty Center and to LACMA are at the top of my list this season. At the Getty Center is “Caravaggio: Masterpieces from the Galleria Borghese” one of my most favorite art venues in Rome. Three of Caravaggio’s best-known paintings are exhibited along with other Baroque works from the museum’s collection. These major works exemplify the crucial stages in Caravaggio’s short career (he died at age 39). Thru 2/18/18. 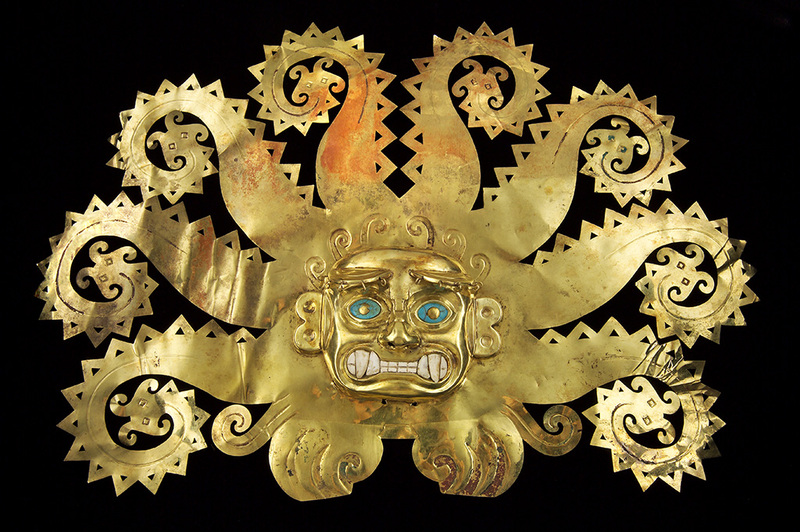 Also at the Getty is “Golden Kingdoms: Luxury and Legacy in the Ancient Americas” part of PST/LA LA. 300 masterpieces are included in the exhibition which traces the development of luxury arts in the Americas from about 1000 BC to the arrival of Europeans in the early sixteenth century. Thru 1/28/18. There are rave reviews for “Painted in Mexico, 1700-1790 Pinxit Mexici” at LACMA . It is a groundbreaking exhibition devoted to 18th century Mexican painting, a vibrant period marked by major stylistic developments and the invention of new iconographies. The exhibition includes over 100 works with 7 main themes: Great Masters, Master Story Tellers, Noble Pursuits and the Academy, Paintings of the Land, The Power of Portraiture, The Allegorical World, and Imagining the Sacred. The exhibition helps provide a better understanding of Mexican painting in particular and transatlantic artistic connections in the 18th century in general. Thru 3/18/18. The most recent and noteworthy exhibition that I visited was “Degas: Takng Shape as a Sculptor” at the Norton Simon Museum. With a backdrop of drawings and pastels by Degas, the exhibition focuses on the museum’s collection of modèles, the first and only set of bronzes cast from the artist’s original wax and clay statuettes. This unique set of sculptures served as the matrix for the serial bronzes that followed, and in some cases they preserve objects or evidence of Degas’s handwork that has been altered in the wax originals. Thru 4/9/18. The Brand Library and Art Center presents “ONE YEAR: The Art of Politics in Los Angeles.” The exhibition features the work of 20 Los Angeles-based artists who engage with political topics as an integral part of their practices. The exhibition presents a multiplicity of voices, constructing a narrative from a wide range of disciplines including video, painting, drawing, fiber arts, ceramics, mixed media and photography. Among the artists exhibiting there are Kim Abeles, Eileen Cowin, Emily Elisa Halpern, Constance Mallinson, Alexis Smith, Linda Vallejo and many others. Continues thru 1/12/18. Honor Fraser Gallery’s exhibition of paintings by the late pioneer Feminist artist Miriam Schapiro are stunning. While living in California during the years 1967 through 1975, Miriam Schapiro embarked on a groundbreaking series of paintings made with the aid of computer imaging. The exhibition features eight works made between 1967 and 1971. Continues thru 2/17/18. Blum & Poe presented Lynda Benglis in her first solo exhibition since her 2011 retrospective at MOCA. The exhibition will provided many samplings of her work over the past three decades of her sculpture practice. It featured glazed ceramics, examples from her bronze fountain series, large-scale biomorphic aluminum sculptures, a constellation of recent paper wall works and the eleven-foot phosphorescent cast polyurethane Hills and Clouds 2014. Glittering handmade paper on chicken-wire armature works hovered on the gallery walls. Ended 12/16/17. “Revolution and Ritual: The Photographs of Sara Castrejón, Graciela Iturbide and Tatiana Parcero” is Scripps College’s contribution to Getty PST LA/LA in their Ruth Chandler Williamson Gallery. The exhibition focuses on the works of three Mexican women photographers who explore and transform notions of Mexican identity in images that range from the documentary to the poetic. Continues thru 1/7/18. Also part of Getty PST LA/LA is the exhibition “Judithe Hernández and Patssi Valdez: One Path Two Journeys” at The Millard Sheets Art Center in Pomona. The two artists took seemingly parallel paths from their childhoods in East Los Angeles to their coming-of-age during the Chicano Civil Rights Movement in the 1970s. Hernández was the fifth artist (and the only woman) invited to join the collective Los Four and Valdez was a founding member (and the only woman) in the Asco group. Both went on to successful individual careers. Continues thru 1/28/18. Also at the Vincent Price Museum is a group exhibition organized by Freewaves entitled Dis..miss. The exhibition includes twenty artists and art collectives’ short, original commissioned videos and offers postcards in trade for viewers’ answers to provocative questions related to gender. The artists’ works consider dialogues between feminism and gender fluidity, asking such questions as: “Who decided your gender?” “How can feminism support equality?” and “What is the problem? My body? Or society’s perception of my body?” Visual artists include: April Bey, boychild, Cassils, Chan and Mann, Roya Falahi, Alexandra Grant, Micol Hebron, Thinh Nguyen, and Shizu Saldamand. The video artists are: Adebukola Bodunrin, Mail Order Brides (Eliza Barrios, Reanne Estrada, and Jenifer Wofford), Gloria Morán, Meena Nanji, and Caress Reeves. Dis..Miss is organized by Freewaves, the media arts organization promoting engagement on current issues through art. To view Dis…Miss videos, postcards and events visit freewaves.org. Thru 2/10/18. The newly opened ICA LA (formerly the Santa Monica Museum of Art ) is committed to making contemporary art relevant and accessible for all. The inaugural project for ICA LA’s courtyard wall on 7th Street is a large-scale temporary work by local artist Sarah Cain . The title, “Now I’m going to tell you everything” is from a poem written for the artist by celebrated poet Bernadette Mayer. “Cain’s abstract paintings often flirt with installation, unfolding across walls and floors, uncontained by the frame of the canvas. Recent work incorporates furniture, textiles, jewelry and found objects as a way to break up the experience of painting as a two-dimensional form. Her vivid, playful patchwork of lines and shapes resist simple definition, recalling styles as diverse as abstract expressionism, graffiti, Pop and Feminist craft.” Continues thru 12/31/17. The wonderful Getty PST LA/LA exhibition titled “The US-Mexico Border: Place, Imagination, and Possibility” continues at the Craft and Folk Art Museum. It presents the work of contemporary artists who explore the border as a physical reality (place), as a subject (imagination) and as a site for production and solution (possibility). Ends 1/7/18. “Radical Women: Latin American Art 1960-1985” is at the UCLA Hammer Museum. This show is part of Getty PST LA/LA and provides visibility to the artistic practices of women artists working in Latin America and US-born women artists of Latina heritage between 1960 and 1985. Continues thru 12/31/17. Very noteworthy are the current exhibitions at the California African American Museum . “We Wanted a Revolution: Black Radical Women, 1965-85” focuses on the work of African American women artists by examining the political, social, cultural and aesthetic priorities of women of color during the emergence of second-wave feminism. The exhibition highlights the voices and experiences of women of color as distinct from the primarily white, middle-class mainstream feminist movement in order to reorient conversations around race, feminism, political action, art production and art history in this significant historical period. The artists represented in the exhibition include Emma Amos, Camille Billops, Kay Brown, Vivian E. Browne, Linda Goode Bryant, Beverly Buchanan, Carole Byard, Elizabeth Catlett, Barbara Chase-Riboud, Ayoka Chenzira, Christine Choy, Blondell Cummings, Julie Dash, Pat Davis, Jeff Donaldson, Maren Hassinger, Janet Henry, Virginia Jaramillo, Jae Jarrell, Wadsworth Jarrell, Lisa Jones, Loïs Mailou Jones, Barbara Jones-Hogu, Carolyn Lawrence, Samella Lewis, Dindga McCannon, Barbara McCullough, Ana Mendieta, Senga Nengudi, Lorraine O’Grady, Howardena Pindell, Faith Ringgold, Susan Robeson, Alva Rogers, Alison Saar, Betye Saar, Coreen Simpson, Lorna Simpson, Ming Smith and Carrie Mae Weems. Also at the CAAM is “Lezley Saar: Salon de Refusés”. This stellar exhibition includes three of Saar’s most recent series of works: Madwoman in the Attic/Madness and the Gaze, Monad and Gender Renaissance,along with a selection of early altered books that show the origins of the artist’s interest in literature, mixed media and marginalized figures. Runs thru 2/18/18. I do encourage you to visit the remarkable Getty PST LA/LA exhibition titled “Another Promised Land: Anita Brenner’s Mexico” continuing at the Skirball Cultural Center .The exhibition offers a new perspective on the art and visual culture of Mexico and its relationship to the United States as seen through the life and work of the Mexican-born, Jewish-American writer Anita Brenner(1905-1974). Runs thru 2/25/18. Among the many amazing exhibitions that are part of Getty PST LA/LA is “Anna Maria Maiolino” at MOCA. In this first retrospective in the United States, MOCA brings together over five decades of paintings, drawings, videos, performances, sculptures and large-scale installations to chart the path of an extraordinary artist. This major mid-career survey focuses on the artist’s more than 25-year exploration into ideas of time, narrative, memory and the senses demonstrated in her installations utilizing found and fabricated objects. Ends 12/31/17.